Grapefruit (Citrus paradisi) is believed to have been produced in Jamaica about 300 years ago by the accidental pollination of a pomelo and an orange. It was named for the way the fruit grows in clusters, like grapes. All varieties of grapefruit have no fat or cholesterol and are rich in vitamin C, potassium and pectin, a soluble fiber that helps lower blood cholesterol. They are a good source of vitamin A, folate, iron, calcium and other minerals, and also contain bioflavonoids and other plant chemicals that protect against cancer and heart disease. 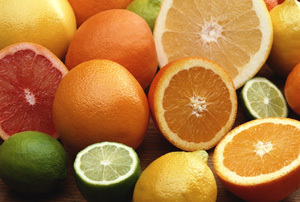 Grapefruit stimulates the appetite and is used for its digestive, stomachic, antiseptic, tonic and diuretic qualities. Pink and red varieties are high in beta carotene, a precursor of vitamin A. On the downside, grapefruit can have serious interactions with many commonly prescribed medications, so check with your pharmacist before eating large amounts. Line serving platter or individual salad plates with lettuce and watercress. Arrange avocado and grapefruit, top with raspberries and sprinkle with dressing.